Time just bloody flies… full stop! Tell me something… why does the saying go, “time flies when you’re having fun”? That suggests that good times will whizz by in a flash, and that conversely, you will wallow in your misery when times are crap because time doesn’t fly when you’re not having fun?!?! Whatever!!! 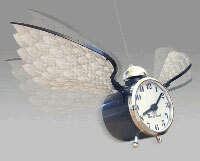 Let’s face it, for everyone out there over 30, you have already realised … Time just bloody flies… Full stop! Sun Goddess pointed out something to me yesterday, I have had my little car for a year already! What???!!! A year??? It’s not possible!!! Simply not possible!!! Then, when I think back, my goodness, she’s right, it has been a year, thank goodness time did fly by for me this last year. Because this last year was all about stress, financial woes, weight gain, renovation of the centre our business was in, adjusting to housemates, etc., etc., etc….